At the age of 23, I moved from NY to the remote Yup'ik village of Kasigluk for a teaching job. The Kuskokwim River Delta is an unforgiving landscape of barren tundra, glare ice, overflow, and wind. I mushed in the region for 8 years, getting my start by helping Quest musher Andrew Lesh train his dogs. By my second year there, I had collected a rag tag crew of scrappy village dogs and began racing, traveling and hunting with a dog team. I loved the lifestyle of being a bush musher, salmon fishing in the summer and fall, whitefish nets under the ice in the winter, cutting my own straw and fire wood, hunting beavers for dog food, and running dogs from village to village on training runs. I'm now living in Two Rivers, outside of Fairbanks, LOVING the wonderful trail conditions. (There's snow on the trails. A rare phenomenon on the Kuskokwim Delta.) I've done dog sled tours the last two summers in Skagway for the cruise ship tourists. At first I was all about racing. After six years of working full time, training, and racing, I decided to get out of the racing aspect of dog mushing. It was driving me into the ground, physically, mentally and financially. I'm also a little over-attached to my dogs to ever be very competitive. I can't bring myself to part with old dogs, and can't afford to get young ones while I'm holding on to all the old ones. At times, I miss the racing especially during the start of the K-300 and Iditarod, but the novelty of racing has mostly worn off. Racing was great, but who wants to finish in the middle of the pack forever. I just don't have the desire to do what it takes to be a winning musher. So now it's all about fun. I do a lot of camping trips. I've got Denali Park pretty much all to myself all winter long. I'd rather spend two weeks breaking trail in the Brooks Range than racing 1000 miles. I focus on training dogs for running off trail, breaking through deep snow, and responding to commands. The main goal each year is to get the dogs ready for caribou hunting in March. Don't we all want to act like cave men sometimes? Running Andrew Lesh's dogs on a 20 mile training run. I couldn't believe how well the whole chaotic arrangement of dogs, ropes, snaps and harnesses worked once they got moving. In a place without roads, it seemed like a great way to get around. Andrew Lesh, a Quest musher, and Bill Eisenbart, who is an old school dog musher living in Bethel. Bill is the most talented dog man I've met yet. He could get his dogs to do anything or go anywhere. 17 dogs at the moment. 12 in harness. I had up to 30 when I was racing, but it always seemed I had just barely enough race-quality dogs to put together a team. 5 to 6 foot chains on a swivel. Oil pans make great bowls. They hold a lot of water and dont easily tip. Keep them clean, warm in the winter, cool and dry in the summer. I supplement the kibble with beef and turkey skins. When I lived in the bush the dogs ate A LOT of fish. Salmon in their main meal. Whitefish on the trail. Fermented salmon when it was cold. Also a lot of beaver. 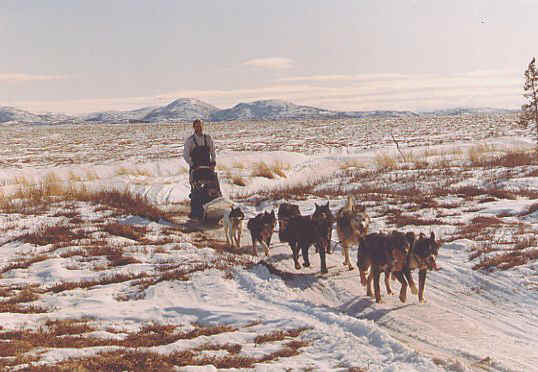 I have mostly village dogs, that were too big or slow for the sprint mushers on the Kusko Delta. I've mostly used other mushers' rejects. I'll give any dog a chance. Pockets: He's one of my first dogs. He's led every race I've ever done, including the entire Iditarod, and single lead for the last 100 miles of my first K-300. He can gee/haw for 100 miles off trail on barren tundra. He's a good swimmer and great for those deep sections of overflow. He now spends all his time on my couch. He's also the only dog I've ever met who will stare directly into the eyes of a human. This was very unnerving to the tourists, who became quite flustered after being stared down by a dog. Bravo: My current #1 dog. He's broken trail for days through two feet of powder. He's a great gee/haw leader. On caribou hunting trips he's my steering wheel, following commands perfectly and resisting the urge to chase the herds. (It's all about outmaneuvering since a dog team can't outrun them.) He can switch-back down steep mountainsides on command. I've only raised one litter of pups. This isn't my area of expertise. Now that I'm not racing, I run the dogs enough to keep them in shape for camping trips. Expose the dogs to as many situations and trail conditions as possible. Work on off-trail abilities and gee/haw. Keep things positive and build trust so that when you're out in the wilderness or in a tricky situation, and need to ask the dogs for an extraordinary effort, they'll come through for you. Ask yourself: Is the experience worth the expense? Can I win enough money to pay for it? If your chartered airplane is going to cost you $1000 to get to the start of a 150 mile race in a village, but you have a good chance of winning most of that back, it's like an all expense paid adventure vacation to a remote part of the world. When the weather or trail is bad. If it's bare ground and overflow during a blizzard I usually finish alright. Once I'm asleep I DON"T wake up. I had five alarm clocks for the Iditarod, two of which were located in pockets sewn into the ear-flaps of my hat. I slept through them all more than once. I've also got big slow dogs. Too many things I'm not willing to do. The world will run out of oil and we'll all be using dogs. Take as much advice from the old time gurus as you can get. And, invest in a really good snow hook. Heading across the tundra from Kasigluk to Kwigillinok on the Kusko Delta is a 100 mile trip of tussocks and lakes with no trail. A friend and I headed out with me running Pockets in the lead and a big marine compass mounted on my handlebar. For the first 20 miles it was non-stop geeing and hawing, trying to stay on lakes and ponds as much as possible while avoiding the bumpy tundra; heading for a compass bearing on the featureless horizon. Eventually my lead dog Pockets figured out the general direction we were heading and went for it. I more or less stopped directing the dogs. My leader took us on a winding route, following lakes, hardened snowdrifts and ponds, but STAYED ON COURSE. After 50 miles we were only off by a few degrees. During my one and only running of the Iditarod, I was doing much better than I expected. At the McGrath checkpoint where I took my 24 hour layover, I was in 35th place, had 15 strong dogs still in my team and had been holding back up to that point - doing far better than I thought possible. I was on top of the world. And then the dogs got extremely sick with an intestinal bug, and everything fell apart. About 20 teams passed me on the Yukon River as I alternated between long rests and 4 m.p.h. slogs. (Two guys on foot actually passed me twice while traveling up the Yukon.) By Kaltag the dogs were looking better, but still plodding along. 30 miles into the Unalakleet portage, the dogs were physically fine but creeping along in a funk of canine depression. Suddenly Diamond started hammering his harness and barking! Half a mile later a small herd of caribou burst out of a gully and ran parallel to the team. The dogs started loping! The remaining 350 miles or so of the race were spectacular, with the dogs cruising along happy and fast. All season long, I had been combining training runs with caribou hunting. The dogs love it. Especially the fresh, still-warm liver snacks they get after a successful hunt. This really paid off in unexpected ways. That short chase after a small herd of caribou, broke the deep depression my dogs and I were experiencing, and reminded us all that we love doing this. It probably saved my race. I flew with my dogs to Siberia for the Hope race one year, looking for adventure. Upon arrival, I was detained and held by border guards armed with automatic weapons. Although the governor of Chakotka had paid for the chartered cargo plane, no one was expecting me. This was complicated by the fact that my visa had Martin Buser's photo on it. No joke. I didn't see the botched visa until the morning of departure and Martin's visa had my picture on it. (Martin had wisely decided not to go after 3 weeks of delays and obvious problems with a lack of organization on the part of the race.) I brought both visas and "hoped" for the best. I didn't receive a very friendly reception. I don't speak Russian and had no way of explaining to the teenage border guards with machine guns that they were making a big mistake and that I was an invited guest of the governor. We were after all, in Siberia, so where else could they be sent for screwing up. They sent me back after charging me a fee for importing animals. How about a race from Bethel to Dillingham over the Kuskokwim Mountains?